The lion is king of the jungle!The great white shark is sovereign of the seas!The timber wolf is emperor of the forests!But . . . it's lonely at the top of the food chain. It's difficult to fit in when plant eaters can be so cruel—just because you ate a relative of theirs that one time! What's a carnivore to do? 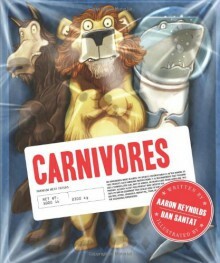 Aaron Reynolds's roaringly funny text is perfectly paired with Dan Santat's mouthwatering illustrations, creating a toothsome book that's sure to stand out from the herd. Carnivores are just doing what they do, so cut them some slack. Fun story, great illustrations.